When Karl Benz gave the world its first production car, i.e. the Benz Velo, little did he know the kind of frenzy he had set in motion. The Benz Velo was afforded the title of being the fastest production car in 1894 even though it offered a top speed of mere 19km/h, well because it was the first production car ever! However, the title didn't remain with the Velo for long and has been succeeded by about 16 cars since then. The fight to beat that record still rages on, and will perhaps go on till the end of time. That was 1894, and we have obviously come a long way in terms of technology, and quite dramatically at that. We have gone from horse-drawn carriages to driverless cars. In between all this, sports cars happened; thank God for that! Lately, a lot of car makers have been slugging it out in the horsepower game. Manufacturers like Ferrari, Porsche and McLaren are constantly seen engaging in a power battle - a battle that has resulted in cars like the Ferrari LaFerrari, Porsche 918, and McLaren P1. These are not the regular sportscars or supercars - these belong to a completely different category called hypercars. It's all about mental power, sci-fi technology and bullet-speed pace. 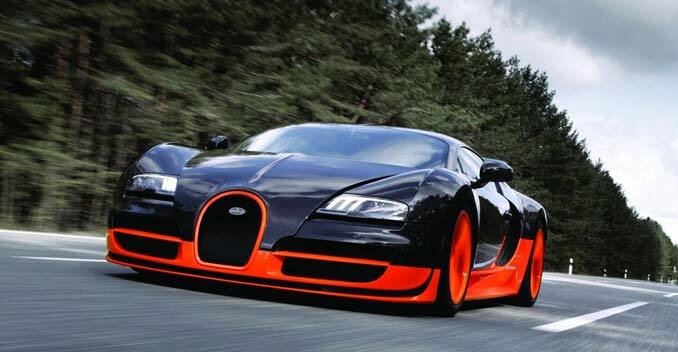 According to Guinness World Records, the current record holder for the fastest production car is the Bugatti Veyron Super Sport, a car that can reach a top speed of 431.072km/h. The Veyron Super Sport's lightweight carbon fibre body and 8.0-litre quad-turbocharged W-16 engine enable it to deliver 1,200bhp of power and a torque of 1,500Nm. As if that wasn't an engineering marvel enough for the world, Hennessey gave us a new contender for the title a.k.a. the Hennessey Venom GT. This hypercar, with a rather obscene amount of horsepower on offer, uses a modified chassis that employs components from the Lotus Exige. 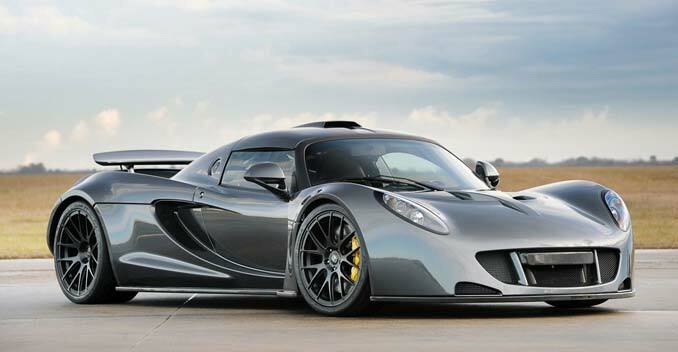 The Venom GT set the record at the Kennedy Space Center in February, 2014 when it hit 435.31km/h. It isn't yet an official record good enough to be entered into the Guinness World Records as the Venom GT didn't do the second run in the opposite direction, as is the requirement for it to be listed as an official record. Still, no one can take away from what this monstrously powerful car has achieved. The Venom, for a great part, owes its mega speed run to a 7-litre twin-turbo V8 sourced from GM. It's an iron block unit with aluminum heads and is decorated for additional boost with twin precision ball bearing turbochargers. The V8 - with its 1,244 race-bred horses performing briskly along with 1,566Nm of torque - would make the driver feel both special and rather nervous, I guess! Long story short, all that technology can take the car from standstill to about 100km/h in just 2.7 seconds. That's less than the time you took to read this statement - if you read it the proper way it should be! "A change to the speed limiter does not alter the fundamental design of the car or its engine." But the competition never really ends, does it? On that note, say hello to the SSC Tuatara, a future hypercar that will be produced by SSC North America, the same company that made the SSC Ultimate Aero. The Tuatara will use carbon fibre construction and aluminium crumple zones to cut down the weight, while the 6.9-litre billet aluminium V8 engine block with twin turbochargers will endow it with the kind of prowess that will help it zip past the Venom GT. I say that as if it's a joke, but it isn't - it's a daunting task by any measure. 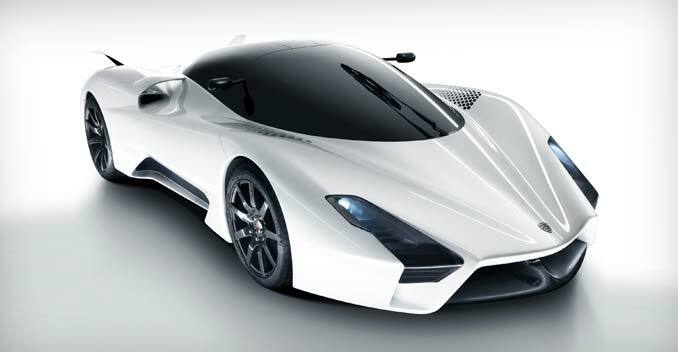 With an engine that will deliver 1,350bhp and 1,735Nm, the company estimates the Tuatara's top speed at 444km/h. Given the not-exactly-subtle undertones of stiff competition even amongst hypercar manufacturers, I am sure technology isn't done blowing away our minds just yet.